Another great day! The White Marlin bite is nuts right now!! Several Blue Marlin around as well. Congratulations to the Oregon Inlet Fleet and our crew on the Pelican! Beautiful weather and a ton of action! September 22 available!! Pretty work Pelican! https://www.fishthepelican.com/wp-content/uploads/img_4652.jpg 500 374 Summer Bracher https://www.fishthepelican.com/wp-content/uploads/2018/11/pelicanlogo-circular-3-300x300.png Summer Bracher2016-09-14 18:42:112016-09-14 18:42:11Flying Flags! Marlin Season Has Started! Take A Look! 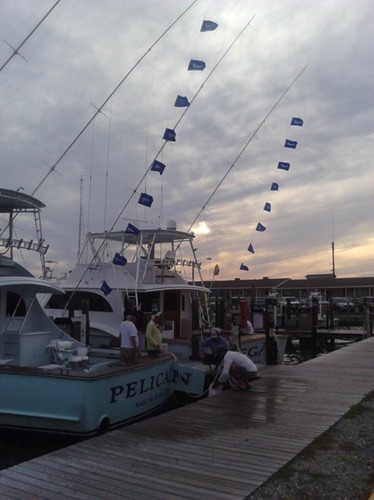 Sonny started our Marlin season and we’re geared up and ready for tail dancing, flag flying FUN! https://www.fishthepelican.com/wp-content/uploads/2018/11/pelicanlogo-circular-3-300x300.png 0 0 Summer Bracher https://www.fishthepelican.com/wp-content/uploads/2018/11/pelicanlogo-circular-3-300x300.png Summer Bracher2016-07-28 10:58:152016-07-28 14:24:42Marlin Season Has Started! Take A Look!